Ginger bread men cookies the spiced short bread cookies always my favourite. I wanted them to make for Easter. But one or the other reason made me to delay making them. I am posting this recipe after 5 days but still i can feel the scent of the spices in the cookies. I feel so christmassy when i grind the spices and when the cookies were baking the smell makes me feel like heaven. I have referred here for the recipe and made some changes according to my taste.Making of these cookies takes some time but each and every minute spent absolutely worth it. They are crispy and full of flavours and looks so beautiful. What else more we want for christmas? Measure the flour and add inside a bowl; add the baking powder, baking soda and salt. Crush the spices slightly in a mortar and pestle and then powder well using a blender jar. Pass the spices through a sieve and add into the flour mixture. Sieve the whole flour and spices to combine well. Or else mix well with a whisk to uniformly mix. Powder the brown sugar in a blender jar. Cream the butter using a whisk or fork and add the powdered brown and beat well without lumps to make a creamy batter. Add the honey and beat well.Now add the flour mixture into two equal lots and mix well with hands and combine to make a dough. Wrap the dough with clingfilm and keep refrigerated for 1 hour. Now divide the dough in to two equal parts and start to roll them on a butter paper| wax paper kept on top and bottom of the dough. Preheat the oven to 180 degrees for 10 minutes. Roll them in to 1/4 inch thickness. Refrigerate the rolled dough if it is soft. 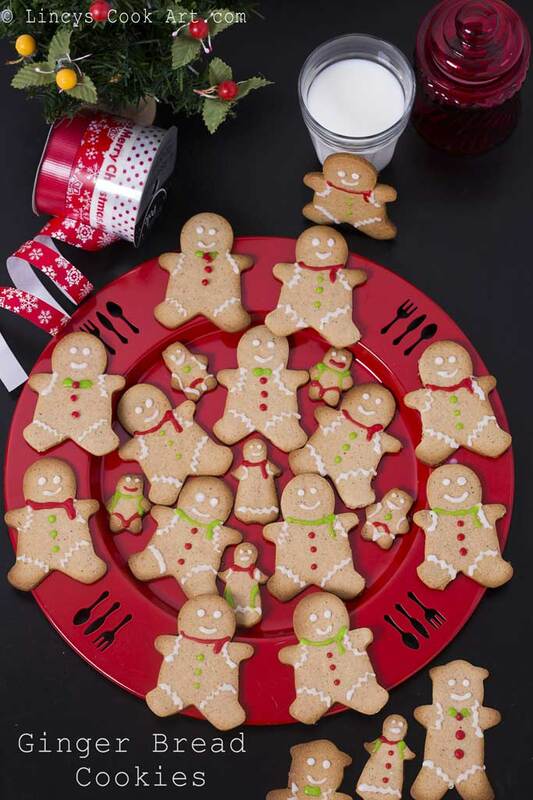 Cut the dough with cookie cutter and carefully take and place the cookies on a baking tray lined with wax paper. After removing the cookies again roll the leftover dough and cut them to make cookies. Refrigerate in between if required. Keep the baking tray inside the preheated oven and bake for about 12-15 minutes depends on the size of the cookies. The edges of the cookies turn brown indicates the doneness. Cool completely and store them. If you prefer ice the cookies with royal icing. In a mix ing bowl add the icing sugar and cornflour. Mix well evenly. Now add the lemon juice. Finally add the milk little by little till you get a slightly thick but flowing paste. It has to flow if you drop from spoon. Divide the icing in to small bowls and add the food colour you wish to add. Take piping bags and fill them and seal the edges with clip of cello tape. Once the cookies are thoroughly cooled cut the edge of the piping bag and pipe the icing over the cookies. Allow to set the icing for 10-15 minutes and store in airtight jars.